Personal injury legal services provide the lifeblood for many law firms. In the last year, over 80,000 new Personal Injury matters were created using LEAP and in January alone there were 10,000 new RTA matters created utilising our RTA Portal. We're vastly experienced in helping law firms in this contentious area of law whether you specialise in Alternative dispute resolution or litigate through the UK courts system. From the moment you receive instructions, gather and review evidence, collaborate with counsel, all the way through to a potential trial, LEAP provide an outstanding digital working solution with all the core tools needed to help your clients get the best results. The Matter Type input screens provides you with unequalled efficiency. Not only can you capture all pertinent information for each matter, you can use your matter information to generate documents with prefilled client and matter information from our extensive range of forms and precedents. The information recorded in a matter will be entered once and populated throughout the case into forms, documents and monthly submissions generated within LEAP. Providing quality content for our clients is what makes us stand out from the competition. Providing a complete and up-to-date library of automated Personal Injury forms, directly accessible from within the matter. Having inputted your client’s information into your matter once, those details are then automatically merged each time you generate a new document from within the matter, allowing you to generate matter documents in an instant. View all automated legal forms available to LEAP clients. Codes and court rates maintained for police stations and Magistrate Courts - Access comprehensive and up-to-date civil and Magistrate court fees ensuring accurate costing. Proactive to legislative changes - We work hard to monitor ongoing form changes so you don't have to, ensuring you remain compliant. Transparency of costs has never been more important, here at LEAP we automate much of the process to help you save valuable time with innovative apps. Statement of Costs - Utilise your LEAP timesheet to automate the Statement of Costs using our new litigation costs tool ‘N260’. We’ve simplified the process of organising your time and fees so you can create a complete N260 in minutes. Save time, improve accuracy, and provide full transparency of your workings. Trial Budget - Our Litigation Costs series seamlessly manages the financial multi-track requirements including the Precedent H. Allocate phases to time & fees, reprice according to the standard rate, identify your forecasted fees and then automate the Precedent H within LEAP. Bill of Costs - Utilise your Precedent H data and save hours of time, stress and the expense of outsourcing to Costs Draftsman with our Precedent S app. Identify all Phases, Parts and legal team members to radically simplify this previously complex process. LEAP's integration with Zylpha, specialists in electronic document bundling for lawyers automates the production of bundles from your LEAP matters. 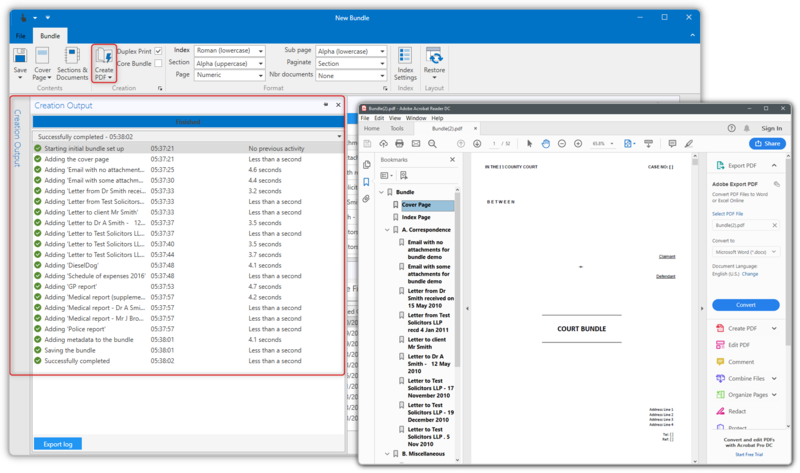 Prepare a bundle for court - manually creating paginated and indexed bundles or briefs to counsel or for a trial bundle. Integrated with the Ministry of Justice mandated Claims Portal, purpose-built functionality within LEAP enables law firms to process low value road traffic accident claims at the click of a button. Having captured the data in LEAP, solicitors can upload the claim directly to the Claims Portal, saving both time and money. LEAP supports law firms across the UK to process high volumes of work efficiently. Profitable – Improve your workload management as claims processing is simplified. Accurate – Validation checks ensure the data required by the Claims Portal is correct. Efficient – No rekeying of data between LEAP and the Claims Portal. Flexible – Track your progress and view notifications if a case changes in the portal. Secure – All data is stored securely in Amazon Web Services data centres, encrypted at rest and in transmission.